The Windows 10 Creators Update has only been available for two weeks and already Microsoft is prepping further upgrades for the operating system, this time in everyone’s favorite category: battery life. The firm announced today via a blog post that a feature known as Power Throttling would soon come to Windows 10 for laptops and tablets. This feature is already available for testing within the latest Fast Ring build of the Windows 10 Insider Program – basically a public beta test anyone can join – software, Build 16176. A deeper follow-up to Microsoft’s Battery Saver feature, Power Throttling allows you to determine whether the demands of specific apps and system processes on processor resources are, well, throttled. That is, limited in terms of exactly how power much those demands can draw. Depicted via a handy, easy to understand slider with “Best battery life” on the far left and “High performance” on the far right, Power Throttling seems flexible in its depth. It can either be as simple as that slider, or you can determine each app and process to be throttled or not to be throttled. You can even control the tool via a mix of both methods. Microsoft claims to be seeing reductions in CPU power consumption for some of the most strenuous use cases by as much as 11% through early testing of this tool. That reduction, in turn, of course should lead to longer battery life. A new, sophisticated detection system in Windows 10 determines which apps are to be throttled, when and by how much, inferring by the frequency of use of other apps. This is another example of machine learning, albeit in a small way, at play. However, this feature is made possible in part by Intel’s Speed Shift, a processor feature that allows the CPU to determine its own frequency and voltage. Naturally, said feature only exists on Intel Core series processors from the 6th generation (Skylake) and later. So, whenever this new feature hits a final, consumer-ready build of Windows 10 – likely that second major release we’re expecting this fall – you better have an up-to-date laptop hardware-wise. That said, Microsoft is “working on expanding support to other processors as well over the next few months,” Microsoft Director of Program Management Bill Karagounis wrote in the blog post. 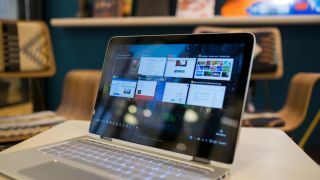 At any rate, we’re looking at a new Windows 10 feature that could see longer battery life out of a huge (and growing) number of Windows laptops and tablets – hopefully by this fall.